Longines Global Champions Tour will enter an exciting new partnership with HR Owen Bentley for the spectacular London leg of the international circuit, it can be announced. The luxury cars and SUVs of the famous British brand will be adding dynamic horsepower to the event at the quintessentially British venue of Royal Hospital Chelsea from Friday to Sunday this week. 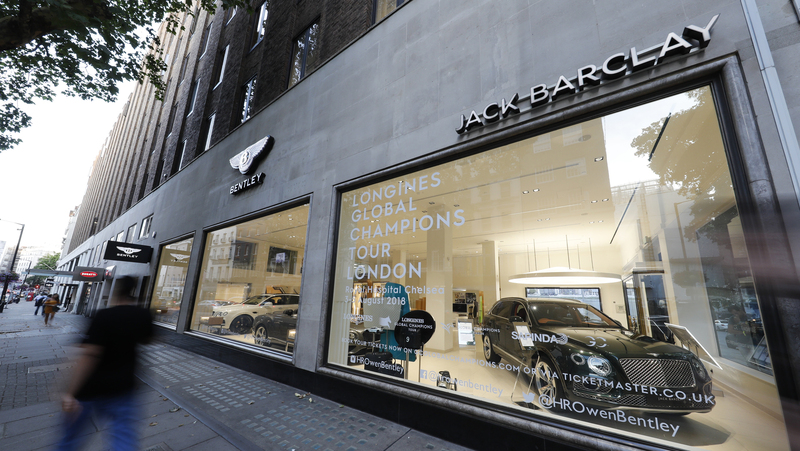 The high profile Jack Barclay Bentley showroom in London’s famous Berkeley Square proudly promoted the partnership this week with Longines Global Champions Tour of London as workers and tourists passed by. HR Owen Bentley will be the Official Car Partner and International guests from around the world will be chauffeured in the latest models to and from the venue and fans can take a close up look at the new Bentley Continental GT and the Bentley Bentayga SUV in the Exhibition Village each day. For more information contact HR Owen Bentley by clicking here.